My Dad did the headline. I am no good at that stuff. Our trip up from Florida was pretty neat. They had a wine tasting for my Dad and Mom and I had a coke and some cheese cubes and broccoli. I guess I will never be invited to President Bush‘s (the old one) dinner table since my Dad said he didn’t like broccoli. Then we had early dinner in the dining car. I had chicken nuggets and mac and cheese (you were expecting something else:). Then we went back to the room and after awhile, My Mom and I went back to the lounge car to watch the movie “Gnomeo and Juliet” about competing families of garden gnomes who fall in love. It was okay but not like Transformers or Cars. I slept in the upper bed which I have always wanted to do. It has a net you hook up to the ceiling so you don’t fall out. The train moves around a lot but in a way it makes you sleep better. When I woke up we went to breakfast of muffins, bagels, cereal, fruit and orange juice. Then we found out we would be getting into Lorton early. When we got back to the car my dad called up Google maps to see where we were exactly and found out we were approaching Turner Field at Quantico Marine Barracks where the Presidential Helicopter Squadron is based. Sure enough we passed by the new operations and maintenance facility and saw a couple of the Boeing CH-46 Sea Knights but none of the familiar Sikorsky VH-60 “White Hawks” in Marine Green used by the President. My Dad told me that the VH-60 can fold up its props to go on an Air Force C-5 and be taken anywhere in the world for the President. Neat! Then we arrived early in Lorton, go semi-lucky and go the car in like 20 minutes took off for Cooperstown on a long, long, long drive. We stopped for lunch on the Deleware Turnpike outside of Wilmington and another time for a coffee and coke on I-476 in Pennsylvania. 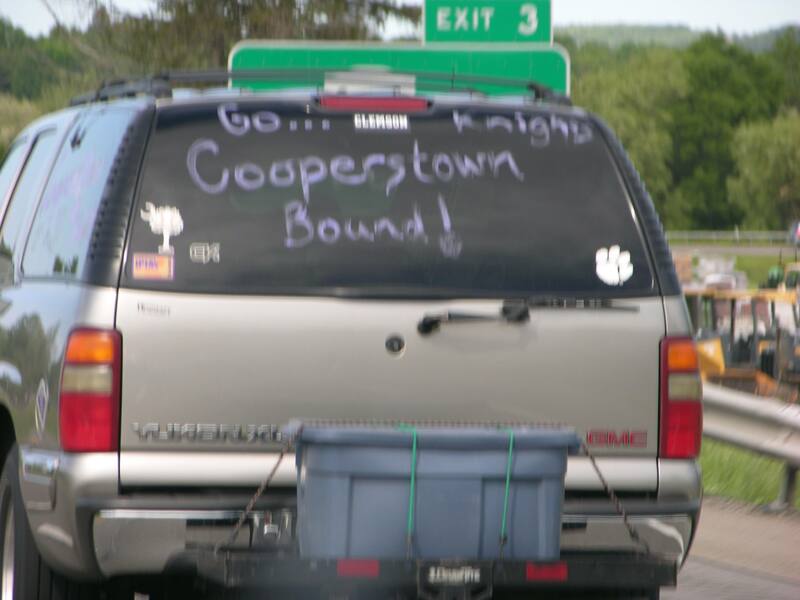 Driving on I-81 from Binghampton we saw this car going to Cooperstown – my Dad said it was kids going to the Dream Park to play baseball. We are now in our lakeside cottage on Lake Canadaroga in Richfield Springs. We went to the store to get food and have had our dinner. Now I am watching Pawn Stars. I love that show. This is Frederick and tomorrow I go to Cooperstown to meet America’s baseball heroes. 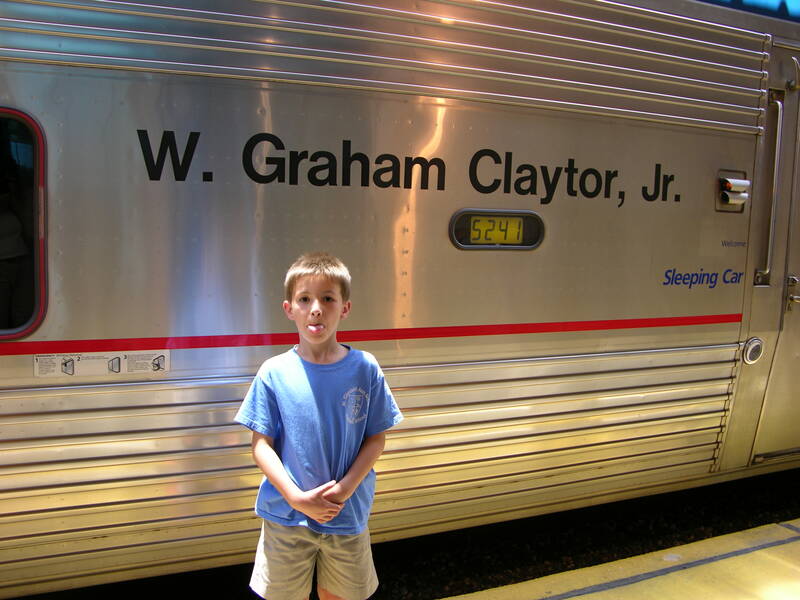 Our car for the trip north on Auto TrainReady to ride the rails.